Hilary Duff? Yes. Jamie Foxx and Leonardo DiCaprio? Sort of. On a recent Jimmy Kimmel Live, Jamie Foxx – for a by-applause non-Tinder using in-studio audience – gave the musical treatment to some real profiles found on the popular App. The last one is a doozy! Meanwhile, earlier this week, Hilary Duff revealed to LA radio’s Valentine in the Morning that she has decided to give Tinder a try. 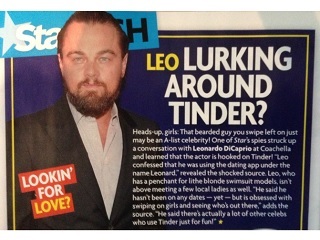 The brief Star item was headlined “Leo Lurking Around Tinder?” and, just for good measure, had a question mark in the secondary headline as well (“Lookin’ for Love?). Had we been making up this item, we might have dressed it up with the idea that at age 40, Leo is having a full-blown celebrity mid-life crisis, with Smartphone in hand.